We bring art, imagination and fun to an event! 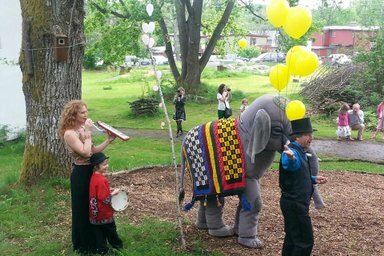 From working with Ampo the Elephant, through involving the youth, children or anyone who want to be children for a little while, to bringing in professional dancers, musicians and actors for a unique experience. We work to make the event unique in every way. This photo is from the Summer Fest at Nesoddparken in Nesodden, Norway. An event by artists of all kinds for the families in the local community.